The Mundy sisters, all single women ranging in age from the mid-20s to nearly 40, live together in relative peace and harmony in the house where they were born and bred. Division of labor is long established. Kate, the oldest sister, works as a teacher in the parish school and provides most of the income. Maggie, the middle child, takes care of the everyday chores like cleaning, feeding hens, preparing lists for shopping, and keeping her sisters cheerful. Agnes, the second eldest, and Rose, have an independent income knitting gloves for a broker who merchandises them. Rose, fourth among the sisters, is mildly addled and gets some parental attention from her sibs. Agnes also prepares the sisters’ daily meals. Chrissy, the youngest, is a free spirit who helps Maggie with housework and Agnes with the gloves while taking care of her son, Michael, a love child that is adored and petted by all of the Mundys but is also a source of shame in the small Catholic enclave that is Ballybeg, Ireland in August 1936. As Michael tells us in one of his several narrations in “Dancing at Lughnasa,” Brian Friel’s lovely play that is enjoying a darling, affecting production at Philadelphia’s Curio Theatre, routine life for the Mundys is about to change during the last weeks of summer in 1936. Forces beyond the sisters’ control will challenge even this closest and most functional of families. The seams binding it together will tear and the fabric that appeared to be woven so tightly will unravel. In his wisdom, Friel chooses to show the cohesion of the Mundys, their teamwork in running their small house, and their roles in taking care of Michael and their uncle, Jack, a priest who ministered to a leper colony in Uganda and has now returned to Ballybeg to recover from malaria and resume his life and vocation, as best he can, in Ireland. Friel depicts the joy and humor of the sisters while also letting us see how they solves problems and foreshadowing the harder times that are to come. In Gay Carducci’s splendid production for Curio, we see more than teamwork and affection. We meet five woman, cannily individuated by Friel, Carducci, and her marvelous cast, who touch us one at a time and as a group. Curio’s might be the ninth or tenth “Dancing at Lughnasa” I’ve seen, and it ranks as my favorite, a well-conceived and beautifully acted production that leaves none of Friel’s ideas or nuances unplayed and creates a warm, toasty, secure feeling that makes it all the more heartbreaking when you realize all you see is about to fall apart, and the Mundys, as we are introduced to them, will be no more. Carducci has cast actresses that never miss a line or an opportunity to convey their character’s distinct personality while avoiding being flashy or disturbing the tight, elegant ensemble feel of the production. The Mundy home is a place you would want to visit and pass time. The sisters are always busy. Even the idlest of them, Chrissy, is rummaging about the house and keeping an eye on the yard where Michael is making kites. As they discuss Ballybeg gossip, fuss with a temperamental wireless radio they call Marconi, sift flour, knit gloves, put away items Kate brings from the shops in town, or talk about their parents and their youths, the sisters reveal volumes about their separate emotional lives and their shared experience. The knowledge we glean from their natural and animated conversations eventually stirs our hearts as we realize the fates of the various women and want to stop time from altering anything that will rattle the seemingly firm foundations that support the Mundys of Ballybeg. Friel’s play is gentle, meandering smoothly from scene to scene planting seeds of drama to come. Carducci deftly uses Friel’s roundabout tone in crafting her production. The Mundys, as she presents them to us, have a sweet, organized everyday existence, leavened by Maggie’s candid and sometimes bawdy comments, kept in order by Kate’s strictness and religious bent that show both her schoolmarmish style of discipline and her respectable Catholic upbringing, interrupted by Rose’s innocent but troubling lack of understanding, and softened by mother and aunts all paying affectionate attention to Michael. Carducci and company depict a concrete and thorough world that continues on a kind of workaday inertia that suits its inhabitants and seems eternal. Upheavals occur. Money is a constant worry. Content within reason as the sisters seem to be, you get the impression that nothing can happen that can’t be solved. Of course, some boredom and tedium arise. The solution to that is Marconi, the radio that brings big band music and traditional Irish dance rhythms into the small but busy Mundy kitchen. Emotion is measured in the Mundy home. The sisters are generally calm, their conversation remaining interesting because of the energy in the actresses’ voices as they live the Mundys’ everyday. Sometimes, though, an outburst is imperative, and “Dancing at Lughnasa” provides a few moments when one of the sisters erupt with abandon in Irish dance or partner gracefully in a fox trot. One of the key moments in the play, and a simultaneously thrilling, happy, and intense moment in Carducci’s staging, comes when the sisters have been discussing attending, for the first time in years, the harvest dance that Ballybeg holds each year at the end of the Festival of Lugh, pagan Celtic god of the harvest. They speak whimsically and expectantly about once again dancing at Lughnasa and, via Maggie, possibly meeting some men their age who will take them away from Mundy domestic bliss. Kate, in her authoritative teacher-like way, scotches the plan, but just as she does Marconi resounds with an infectious Irish dance tune. Maggie gives off grinding grain for the hens, wails loudly, and stomps her left foot hard before going into a full-blooded, fully emotional Irish dance. Rose, who needs little provocation to have fun, joins her. Chrissy, always ready to dance, follows. Agnes then drops her the glove she’s knitting with four needles and takes her place on the floor. As the four youngest Mundy sisters are stomping individually and linking arms around shoulders or holding hands to dance in a group, Kate, the lone holdout, the sister bound by her own code to maintain respectability and discipline, lets out a shriek, stamps her left foot, and goes into an intense solo dance. She kicks up and stomps her feet independent of her sisters. She barely notices them in her grand release from the struggle it takes to maintain her unrelenting strictness. Jennifer Summerfield, in one of many brilliant moments as Kate, keeps her dance private and solo until Chrissy leads the sisters outside, and one of the sisters waves to Kate to join them in a communal circle of joy and abandon, much to the watching Michael’s delight. And ours. The dance is a telling moment and it has special significance in the Curio production that flows so naturally and comes upon this defining moment so organically. Of course Friel scripted the dance, but Carducci and company spring it to it as if nothing else could have done at that moment on stage. Summerfield, Trice Baldwin, Isa St. Clair, Aetna Gallagher, and Colleen Hughes put us squarely in their cottage in Ballybeg in 1936 and all that happens seems as if it is a glimpse of reality and not enacted only by a playwright’s plan. The Mundys, like all Europeans, must deal with the time in which they live. In sequences that are both comic and poignant, Gerry Evans, Michael’s father, visits and talks about going to Spain and joining the International Brigade fighting Franco’s bid for power. Father Jack, the women’s uncle and a long-time source of pride, shows too plainly how his career in Africa has affected him and his faith by behavior that flies against the tolerance of a small Catholic village and has ramifications that are unfair but real. The industrial revolution, decades old by 1936, arrives in Ballybeg in a way to affects the Mundys’ livelihood. The outside issues are instrumental in changing the way the Mundys must live. Michael, as narrator, keeps us informed about the adaptations that are made and their consequences. Meanwhile, all we see at the Curio is delightful or moving in turn. We invest ourselves in the Mundys and their fates. The sisters are so authentic, as are Michael, Jack, and Gerry, we come to care about them as if they are our neighbors and relatives. Carducci’s marvelous production amplifies the quality of Friel’s great play, a Tony winner for Drama in 1992, in every way. This is a great “Dancing and Lughnasa” and should be seen before it fades, as all theatrical productions do, into history on the ides of March, March 15. The Curio cast is sterling. As individuals, and as an ensemble, they illuminate Friel’s material and demonstrate the enlightenment and pleasure that come from excellent acting. Jennifer Summerfield is glorious as Kate. Her eyes also reflect the hardness of her responsibility as the oldest sister and the one who feels beholden to keep the Mundy home together and in check. Summerfield is a reflective Kate. When Agnes, in a rare expression of rebellion, asks Kate to listen to herself when she pronounces rules and standards beyond the need of a situation, you see Summerfield taking in the rebuke. When, later, she responds to it in a quiet conversation with Maggie, you can tell Summerfield’s Kate has taken Agnes’s words to heart and wants, against her nature and training as a teacher, to be different. The teacher is always evident in Summerfield’s approach to Kate. She often deals with her sisters the way she would handle a pupil. Because of the way Summerfield contains herself, the way she gives Kate permission to join in the sisters’ random dance is especially affecting, as is the privacy in which Kate begins to dance in a space away from the others, as if to purge her own individual demons and show, that at 40, she has life and spirit in her yet. Trice Baldwin is a constant delight as Maggie. She exudes humor and good nature whether she is taunting Michael, bothering anyone in sight with one of her riddles, figuring out how to feed eight with three eggs and a loaf of bread, or providing a reasonable approach to any problem Baldwin goes about her business with loving efficiency and naturalness. The way Baldwin ties the Curio production of “Dancing at Lughnasa” together is almost indescribable, but the actress is the linchpin of the proceeding. She sets the tone for the Mundy house and is always on hand to reinforce the humanity and authenticity of the world Friel creates for his characters. Isa St. Clair is all sunshine at Chris, and not always because of her curly, flowing reddish locks. Eternally smiling, St. Clair represents the youth and spirit with which all of the Mundys are or were once endowed. She is a woman who still has romantic ideas that go beyond fantasy. Chris is lucky that her sisters, especially Kate, accept and embrace her love child and his begetting. Although we hear about depressions she suffers somewhat regularly, the Chris we see exudes only life and hope. St. Clair is particularly good in her scenes opposite Steve Carpenter as Gerry Evans, the father of her child and an irregular visitor to the Mundy home. St. Clair’s Chrissy is almost giddy in Gerry’s presence. You see the youthful ardor in the relationship in both characters, and in both actors. St. Clair and Carpenter work as a unit. Unfortunately, you also see the traits in Gerry’s nature that keep him from making a commitment, to Chrissy or to Michael, who is clearly not nearly as interesting to him as Chris is. Colleen Hughes brings out all the uncomprehending roughness in Rose. She is the wild card among the sisters, one whose lack of understanding could one day lead to calamity beyond Chrissy having a child out a wedlock. Chris at least could take care of her child, even if she didn’t have her sisters’ help and support. Rose needs tending, and Hughes lets us see why while making Rose lovably open and ingenuous. In Hughes’s capable hands, Rose displays the telling traits of a Mundy sister while living in her own world, one even more sealed and unknowable than Kate’s. Aetna Gallagher charms as Agnes, the sister with the most worldliness. Though not as rigid as Kate, Agnes is the sister the others most look to for answers and tend to support when she makes a decision. Though not as demonstrative as Maggie, Agnes is accepting of events as they happen. Although it is never said, you can imagine that it is she who prevails when the sisters have to figure out how to respond to Chris’s pregnancy and Michael’s birth. Agnes provides reason even if looks like Kate rules the roost and Maggie maintains the peace. 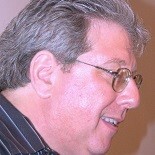 Eric Scotolati has the difficult task of being childlike when called on to play the seven-year-old Michael and engaging when he fills the audience in about matters offstage as an adult. He handles the juxtaposition adroitly. In keeping with Friel’s directions, the younger Michael is never literally seen. The sisters mime his presence while Scotolati speaks for Michael from a point outside their sight range. Scotolati is in perfect pitch as the little boy who is curious about his aunts and enjoys their attention, even when Maggie taunts, but who is restless and precocious and vocally expresses his desire to get on with his playing or other business. As the narrator, Scotolati is a clear, engrossing storyteller who has Baldwin’s gift for phrasing a line and milking all it has to offer. Steve Carpenter is jaunty and good-natured as Gerry who realizes that even with Kate on the prowl, he can visit the Mundys and find general welcome. Carpenter is canny at showing the boyish charm and irresponsible immaturity of Gerry who knowingly makes promises he cannot keep and exaggerates his place in life. It is amazing that Carpenter’s Gerry follows through with anything, but particularly his intention to join in the International Brigade, a commitment he carries out, as Michael reports. Leonard Kelly is superb as Father Jack who never gives away or quite acknowledges how much he and the faith he vows to uphold as a Roman Catholic priest are eroded by the 25=year tenure among the lepers of Uganda. Kelly in unperturbed as he discusses rituals he would like to practice even in Ballybeg. A scene in which he trades items with Gerry is lovely. When Jack talks about marriage and children, Kelly never betrays that he may be shocking his nieces. Jack doesn’t see past the world from which he came to the one he is unsuccessfully re-entering. He is also quite astute in the way in which he plays Jack, suffering from malaria and fighting some loss of memory, particularly of the English language, fishing helplessly for the word that just will not come into his consciousness. 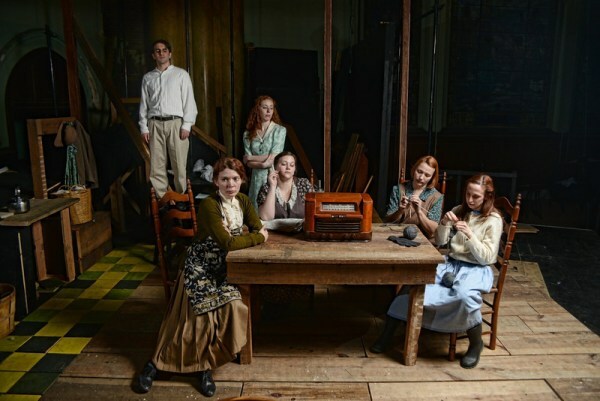 The Curio’s is a wonderful and worthy production of “Dancing at Lughnasa” and is enhanced by Paul Kuhn’s rough-hewn but defining set, Aetna Gallagher’s authentic costumes, and Colleen Hughes’s stirring choreography. Given the dodgy nature of Marconi, Patrick Lamborn’s sound design helps to keep the play in tune. “Dancing at Lughnasa” runs through Saturday, March 15 at Curio Theatre, 48th and Baltimore Avenue, in Philadelphia. Showtimes are 8 p.m. Thursday through Saturday. Tickets are $25 with discounts for students and seniors and can be obtained by calling 215-525-1350 or going online to www.curiotheatre.org. This entry was posted on March 1, 2014 by nzoren in Theater Reviews and tagged Aetna Gallagher, Ballybeg, Brian Friel, Colleen Hughes, Curio Theatre, Dancing at Lughnasa, drama, Eric Scotolati, Gay Carducci, Irish, Isa St. Clair, Jennifer Summerfield, Leonard Kelly, Steve Carpenter, Trice Baldwin.